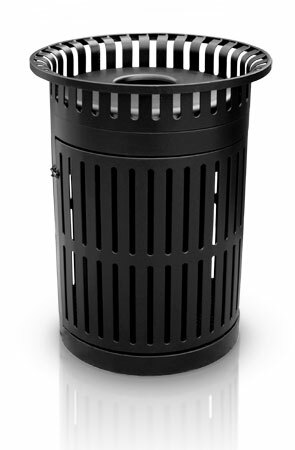 This attractive trash receptacle will complement any high traffic area indoors or out. Manufactured from 1/4" ribbed steel and thermoplastic coated for durability, this commercial grade receptacle will provide years of service. The raised rim around the flat top lid collects waste not properly placed through the opening, preventing trash from accumulating on the ground around the receptacle. Receptacle is 40-1/2" x 32". Flat top cover is included. This trash receptacle is coated with a lightly textured matte Polyethylene finish in any of the color options shown below. Liner sold separately.